Three weeks before the scheduled start of the 2012 Indianapolis 500, we were kept waiting for the announcement of the event’s ceremonial pace car. On Monday, the speedway and the participating car company finally introduced the pace vehicle for the 96th running of the 500-mile race. Set to serve the 33-car field on May 28th of this year will be a 2013 Chevrolet Corvette ZR1. Becoming the 11th time that the Corvette nameplate will preside in front of the race car pack at Indy, this year’s pace car is a near equal to the 2012 IZOD INDYCAR Series Dallara DW12 racers. Covered by Arctic White paint and Pearl Silver Blue full body dual racing stripes, the Corvette ZR1 pace car pays tribute to the famous sports car’s 60th anniversary in the 2013 model year. The third time that the Corvette pacing of the Indy 500 will coincide with the celebration of a production anniversary. Previous occasions occurred during the 25th and 50th anniversary years of the Corvette. The composite body of the 2013 Chevrolet Corvette ZR1 pace car involves the first significant use of carbon fiber in a production version of the American sports car. The hood, front fenders, front splitter, rocker panels and floor pan are produced by the racing-developed carbon fiber material promoting a lightweight, high performance package. 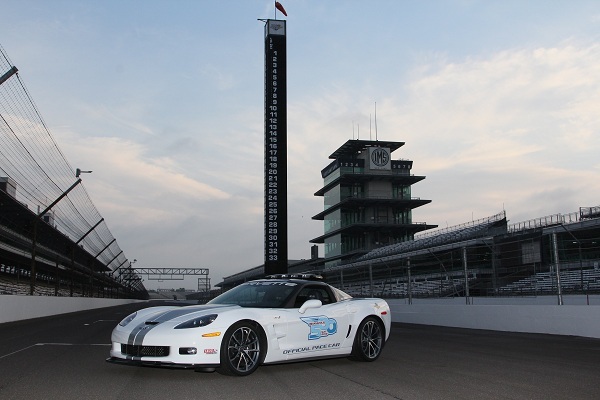 Powered by a supercharged 6.2 liter LS9 V-8 engine, 2013 Chevrolet Corvette ZR1 edition packs the most powerful production engine ever to pace car duties for the Indianapolis 500. The 638-horsepower and 604 pounds-feet of torque, this 2013 edition sports car beats the previous record-setting pace car engine performance of the Corvette Z06 models that led the 2006, 2007 and 2008 Indianapolis Motor Speedway events with an output of 505 horsepower. Delivering power through the rear wheels, the supercharged 6.2 liter LS9 V-8 allows the car to blaze to 0 to 60 time in only 3.4 seconds and a top speed of 205 miles per hour. 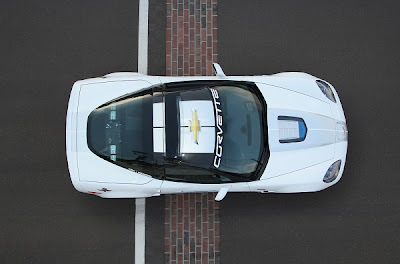 While the 2013 Chevrolet Corvette ZR1 pace car may just be short of speed in making the 2012 Indy 500 field, the street legal sports car is one of the hottest non-race cars to trek at the Brickyard. Along with being the most powerful Indy 500 pace cars in the 96 races at the Indianapolis Motor Speedway, the 2013 Chevrolet Corvette ZR1 rides on advanced suspension that would be disallowed in competition. Performance Track Management provides catered handling for several adrenaline-charged driving scenarios. The 2013 Chevrolet Corvette ZR1 pace car is slowed from its exhilarating drive by Brembo carbon-ceramic disc brakes designed to operate at high performance thresholds. The Corvette ZR1 uses highly-adaptive Magnetic Ride Control for a very disciplined, comfortable travel whether rolling on the smooth, paved distance or over the yard of bricks at the 2.5-mile oval track. The 11th consecutive time since 2002, Chevrolet has been the only pace car of the Indianapolis 500. The 2013 Chevrolet Corvette ZR1 will be the 23rd time overall the bowtie badge will lead the Indy car field to green for the memorial day event. For the first time since 1993 at the Indianapolis Motor Speedway, a Chevrolet-branded pace car will be present in a race where the auto maker has a competitive presence. Chevrolet’s twin-turbocharged V-6 engine enters the 2.5-mile oval as the winner of the first four IZOD INDYCAR Series events. At least 12 Chevrolet-powered IZOD INDYCAR race cars will attempt to qualify for the 2012 edition of the memorial day event.